This 9 day beginner kayak course is designed for paddlers that want to go from beginner to intermediate through an intense, quick, and safe progression into the sport. Experience the magic of whitewater kayaking to pristine natural environments! The fitness level for this course is a 4 out of 5, so get ready for serious, heart-raising physical activity! The more physically fit you are, the more you’ll enjoy these challenging, committing activities. Become a kayaker in just 9 days! This course culminates with an overnight camping trip and river expedition! Kayaking is more than a beautiful sport; it opens places and river communities you can only access by kayak! You’ll be received at Medellín’s José María Córdoba International Airport before driving for 50 minutes to your hotel located in the heart of Medellín’s hippest, cosmopolitan neighborhood: Poblado. Depending on flight arrival time, meet your guides at our adventure cafe Cra. 43e #11-13, Medellín, Antioquia, Colombia) for your first night in Colombia. Welcome to Colombia! After breakfast at your hotel, meet your bilingual professional adventure guide at 8 a.m. our Medellín office (Cra. 43e #11-13, Medellín, Antioquia, Colombia). Start your day with an introduction to all the gear. Select the appropriate sizes of equipment and outfit your kayak. Drive to Guatapé and practice your paddle stroke on the lake and learn some new paddle strokes and boat steering techniques. 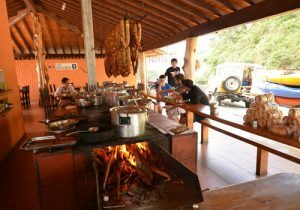 Enjoy the evening discovery the colonial town of Guatapé and its local eateries. Stay overnight in comfortable lodging at a beautiful local farm and practice your Spanish with the locals. After fresh food and fruit for breakfast at the farm, return to the lake for a morning of applying what you learned the day before by practicing your different paddle strokes and techniques in fun scenarios. Paddle to a small island for a delicious lunch. In the afternoon, practice your eskimo roll, flipping over your kayak to turning it upright, and increase your confidence with educative games. Drive to the river community and charming town of San Rafael for the evening. Stay overnight at a permaculture farm, camping or in comfortable beds, and enjoy a farm to table meal in the reserve’s beautiful outdoor eating area. After breakfast at the permaculture farm, head to the river for your first kayak run on whitewater! Learn how to read the currents and anticipate how they will impact your kayak. Discover the different type of hydraulics and the potential hazards of a river, so you learn how to identify similar features in other rivers and skillfully and safely navigate rivers. Return to the permaculture in San Rafael for another relaxing rest in a beautiful, natural environment along a river. After breakfast at the farm, go to a river with a small section of rapids. With your guide, apply what you learned previously by analyzing the rapids to define an optimal line, and following it with your instructor. Before sticking the line, we will thoroughly learn and practice rescue techniques and scenarios. Finish the day with a mini-slalom course, where you will practice your eddy turns to catch eddies. Stay overnight in the San Rafael permaculture farm. You can always ask questions to your guide over dinner or breakfast! After breakfast at the farm, you are ready to head to the river with confidence to paddle a whole section of river! We will drive to the upper Rio Guatapé put in, an 8 km stretch of class 2 to 3 whitewater. Get ready for a full day of adventure in a beautiful natural setting with water that is crystal clear and rapids that form from white round granite boulders. This is when you will realize the magic of kayaking as a means for exploration to pristine environments.Enjoy lunch on the river. Towards the end of the river, there are two small drops, which gives you the occasion to try your first waterfall! Celebrate your first day as a whitewater kayaker in Medellín. Stay overnight in San Rafael. After breakfast at the permaculture farm in San Rafael, drive 2 hours the put in of the Rio Buey in Santa Barbara. Learn how to load your kayak with overnighter gear for an overnight expedition on the river. 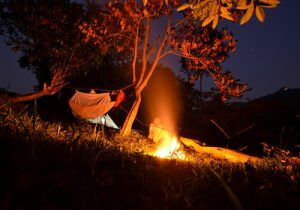 After 3 hours of beautiful class 2 to 3 in remote valley, we will set up camp for the night and spend the evening by the river, cooking and enjoying the incredible scenery. Sleep overnight in sheltered hammocks. After a campfire breakfast, wake up by the river and enjoy a hearty breakfast before kayaking downstream. Towards the end of your adventure, the Rio Buey enters a magnificent canyon where local wildlife and birds are abundant. We’ll be out of the water in time for a lunch in town by 1 PM. Start heading back to Medellín with scenic, cultural stops along the way (about a 3 hours’ drive). Return to stay overnight in a hotel Poblado for your last celebratory night in Colombia! After breakfast at your hotel, receive an airport drop-off to Medellín’s José María Córdoba International Airport. Extend your trip by 1 day and 1 night with a paraglide flight in San Felix on the morning of your city tour. On Day 9, after breakfast, meet your bilingual professional adventure guide at 8 a.m. our Medellín office (Cra. 43e #11-13, Medellín, Antioquia, Colombia). Take 30 min. private transport to San Felix, a town overlooking the city twenty minutes from Medellín. Join a bilingual guide to take a tandem paragliding flight, depending on weather conditions. No previous experience needed to fly with your instructor. Land on a designated area in the city of Medellín for easy transport to continue your city day tour. Stay overnight in at a hotel in Poblado for the next day’s airport drop-off. Kayaks and paddling gear are included and “Kayak School” is open all year. If you own your own boat please contact us for pricing. 100% deposit must be made one week before the trip, for last minute payment and reservation request contact Expedition Colombia. All payment must be done through our booking platform, or via a deposit in our Bancolombia bank account.